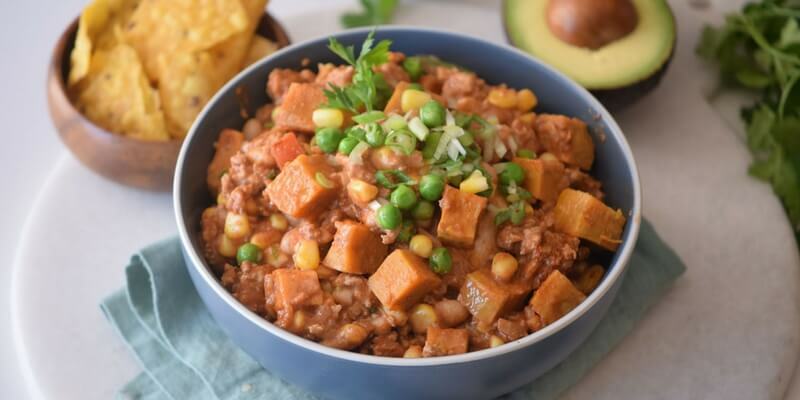 What’s Inside: This Sweet Potato & Turkey Chili is the perfect family-friendly comfort food! Comfort foods are delicious and filling, but sometimes they are not the healthiest. However, with a little tweaking we can totally still indulge AND feel good about it! 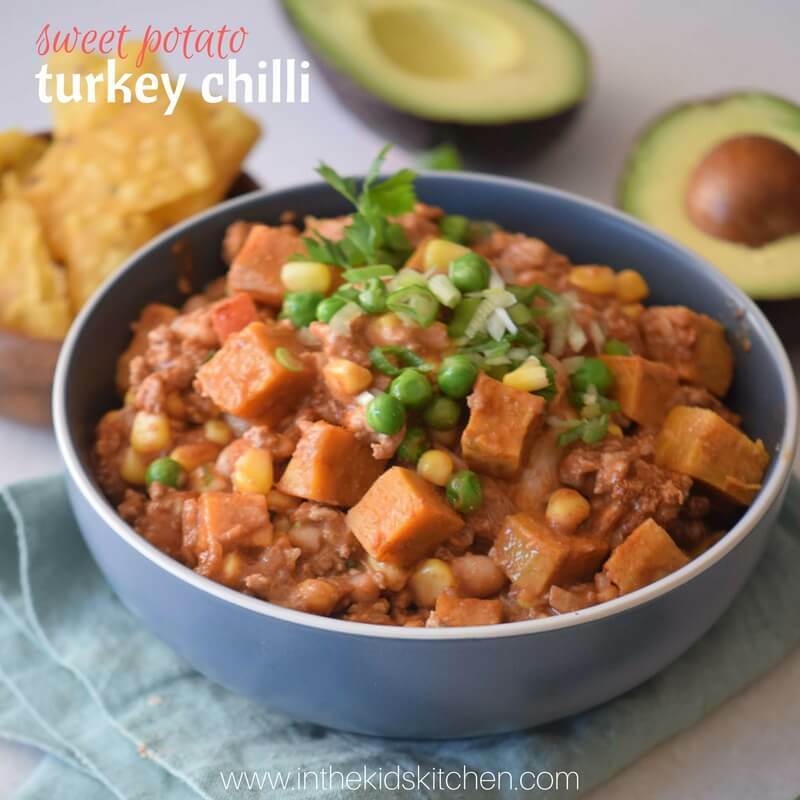 This easy turkey chilli recipe is just a tad spicy, hearty and super good-for-you with lots of veggies and heart-healthy spices. Plus we swapped out the traditional red meat for a leaner alternative: ground turkey. TIP: While we used ground turkey for this recipe, you can easily swap that out for leftover turkey from the holidays or even ground chicken if you prefer. This chilli can be enjoyed as shown, as a big hearty bowlful, or you can use it as a delicious and unique chip dip or spoon on top of pasta or rice. 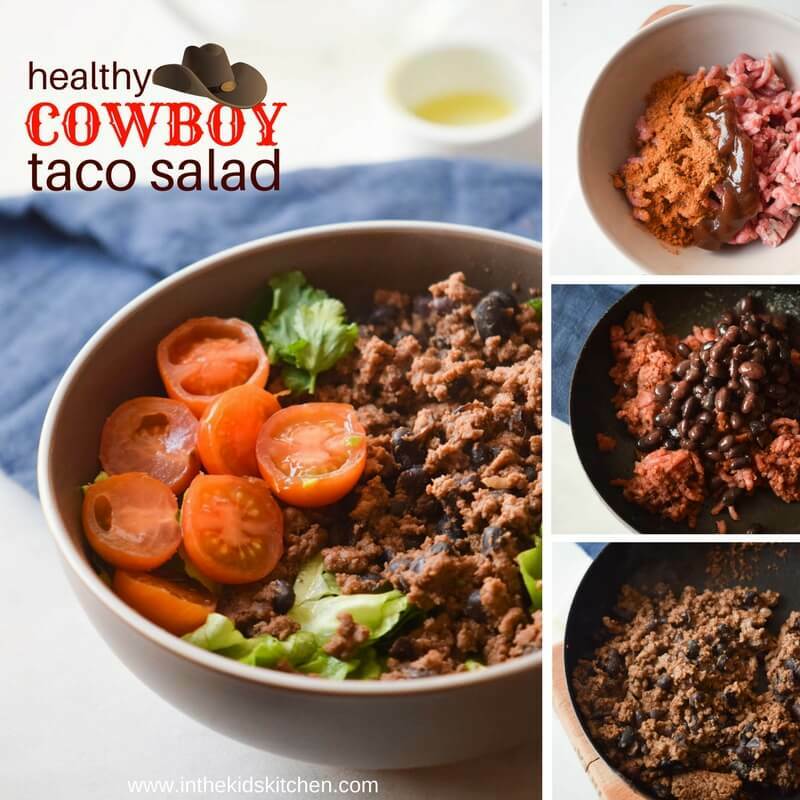 I love serving it on a cup of brown rice and crunching up tortilla chips overtop for the perfect indulgent-yet-healthy meal. Swap out the veggies and spices as you see fit. I just use a mix of colorful vegetables that I know my kids will be happy to eat (hidden onion excepted). Tip: For a less traditional approach you can swap out the tortilla chips for sweet potato chips. Heat oil in a large soup or stock pot on medium heat. Add in the corn and cook until kernels start to brown, but keep a close eye on them so they do not burn. Meanwhile, in a separate saucepan cook the turkey until it starts to brown, then transfer turkey to the soup pot with corn. Add in the beans and all of the seasonings. Stir and cook for 20 minutes. 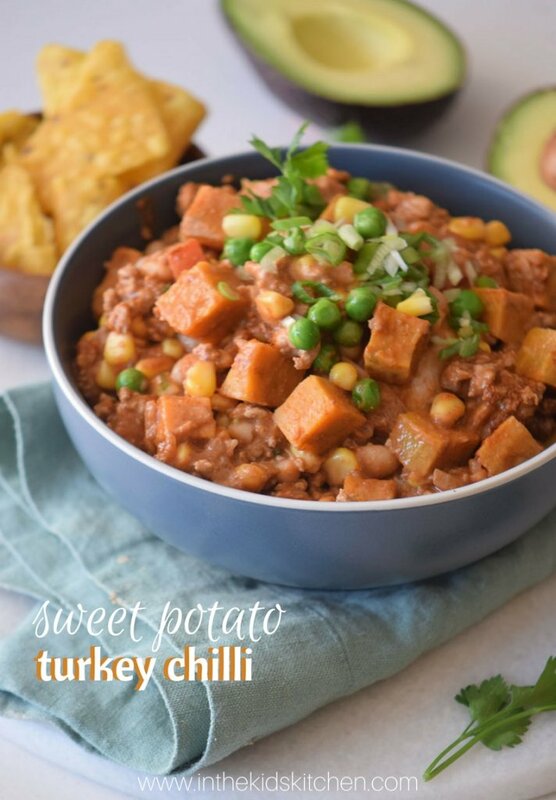 While turkey chili simmers, par-cook your sweet potato. Peel, cut into bite-sized chunks, and microwave on a plate covered with a damp towel for 2-3 minutes. Set aside. 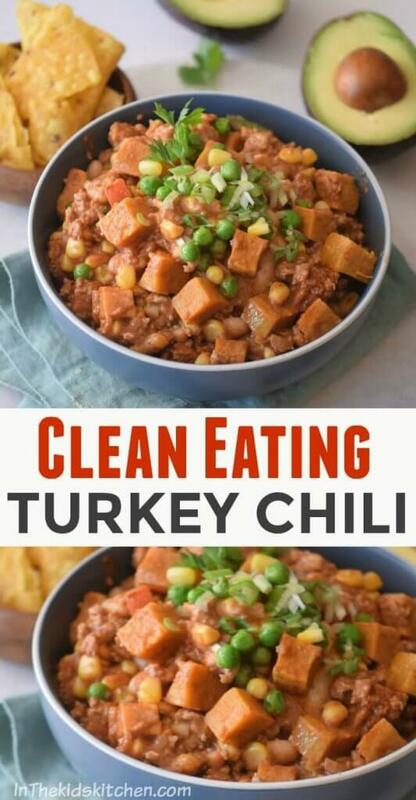 Add peas and sweet potato chunks to your pot of turkey chili and stir to incorporate. Remove pan from heat, cover, and allow to steam for about 5 more minutes. When you’re ready to enjoy, give everything a final stir before serving. Garnish with cilantro and sour cream, if desired. 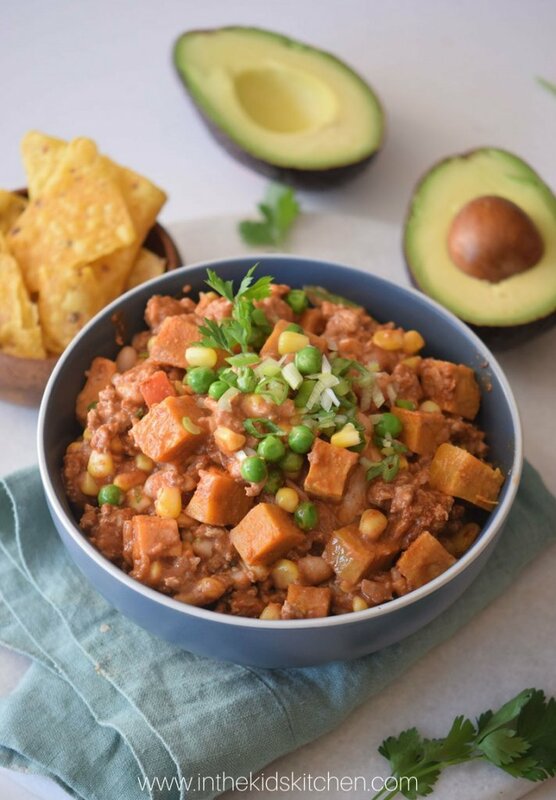 This Sweet Potato & Turkey Chili is the perfect family-friendly comfort food! Heat oil in a large soup pot or stock pot on medium heat. When you're ready to enjoy, give everything a final stir before serving. What’s your favorite comfort food you’d like to see us give a healthy make-over? 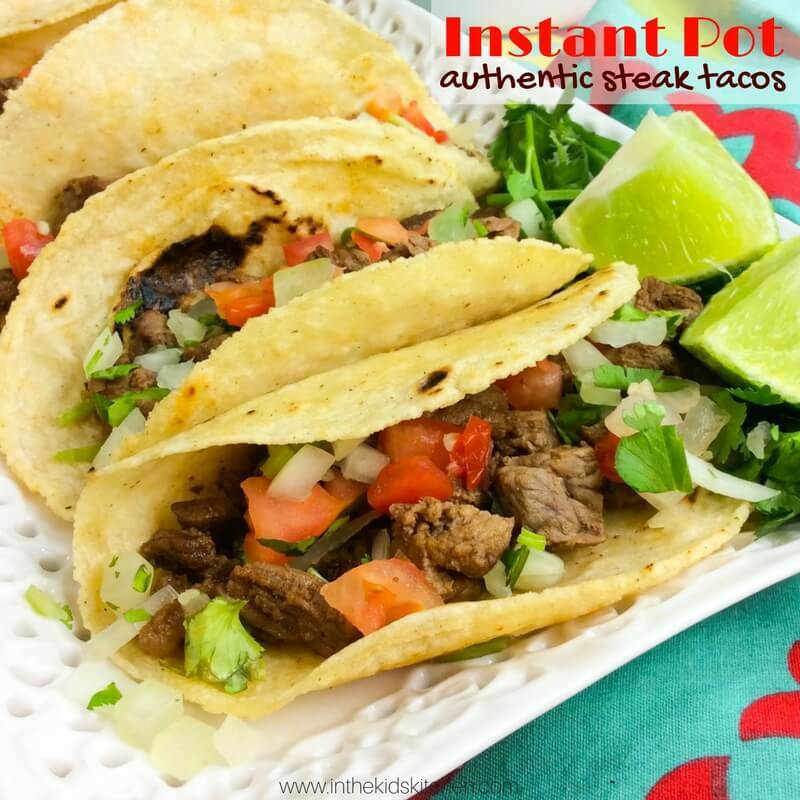 For more delicious healthy yet hearty meals, check our our Instant Pot Steak Tacos recipe or our Cowboy Taco Salad recipe.